Peter Pan FANS WE HAVE THE PERFECT GIVEAWAY FOR YOU!! 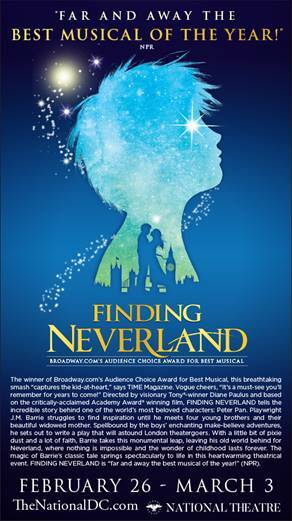 The National Theatre will be shown Finding Neverland, February 26th through March 3rd! Finding Neverland tells the incredible story behind one of the world’s most beloved characters: Peter Pan. We are giving away a “Family 4-pack” of hard tickets for Will Call on Tuesday, February 26th at 7:30pm. The National Theatre, to explore the possibility of partnering on Finding Neverland, which is hitting the stage February 26th through March 3rd! Finding Neverland tells the incredible story behind one of the world’s most beloved characters: Peter Pan. It’s Tinker Bell! This is such a lovely giveaway, would be great to see it in person at the theatre! Love reading Peter Pan to my kids!